Shuttle Manager™ provides a complete migration and coexistence solution from simple migration of inboxes and personal folders, to complex high performance gateways and directory synchronization to and from virtually any e-mail system. 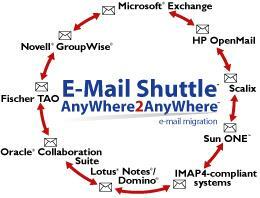 E-Mail Shuttle's LaunchPad™ provides a "point-and-click" interface for configuring and launching the E-mail Shuttle. This interface walks system administrators through the steps of a complete e-mail migration from any e-mail system to any e-mail system and offers context-sensitive instructions along the way. While LaunchPad is one means to initiate and manage the migration, the architecture of the E-Mail Shuttle offers many more options including executing the program from the command line prompt, integrating the migration into existing processes or applications, initiating the program via e-mail, scheduling the program to run as a service, and many other options. The real strength of the Shuttle lies in its flexibility during migration. The E-Mail Shuttle migrates bulletin boards, conferences, calendars, mail lists, forms and more. Whether your users are coming from TAO, GroupWise, Microsoft Exchange, Notes, H&W SYSM, or any IMAP4-compliant system, our E-Mail Shuttle can migrate the data with complete fidelity.